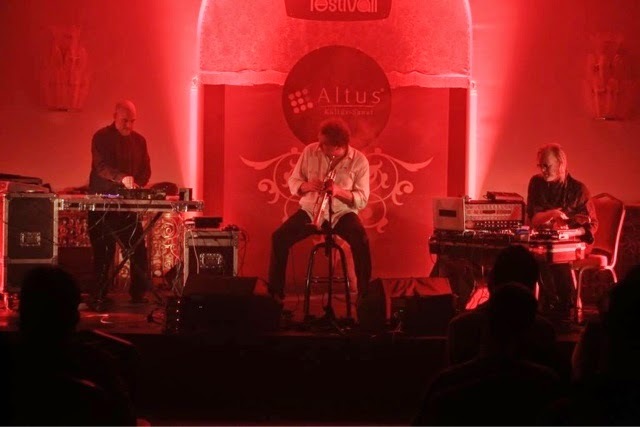 Three prominent musicians of Norwegian contemporary scene, trumpet player Nils Petter Molvaer, guitarist Eivind Aarset and live sampler Jan Bang gave the first concert of first Ankara World Music Festival in Ankara Palace on last Thursday. Actually, the members of this trio have played together for many live performances as well as many pieces of some albums in Nils Petter Molvaer's discography but this trio configuration was something new especially for Turkish followers. The performance consisted of two sets: The first one was the main body with 65-70 minutes and the second one was the closing song of about 10 minutes. Although the main themes were based on Molvaer's previous compositions from albums such as Hamada and Er, the musicians were mostly improvising - sometimes individually, sometimes collaboratively. The level of complexity in these improvisations was so high that just a 10 seconds of concentration lose may cause a listener to be detached from the performance's impressive atmosphere. It was a stimulating concert not only both with the energetic rhythms mostly carried by Jan Bang and the mystic tone of Molvaer's trumpet but also with the special light show. Adding Eivind Aarset's minimal touches and extraordinary sound from electric guitar to these, the overall performance was like spending a night on the limits of jazz, avant-garde, new age, contemporary and even trance music. The impressive vocal sounds created by Molvaer with the microphone of the trumpet and the surprising shifts in tension achieved by Jan Bang are highlights of the performance. The sound design and acoustic conditions were nice too but I think some bass portions of the performance were too heavy for the palace, shaking the ceiling. In my humble opinion, musical performance may sometimes be for musicians themselves or -let me say- for some qualified listeners who have the necessary patience and open-minded musical ideas. For me, such performances are special ones in which you -as a listener- have a chance to put yourself into the position of the performer. In that case, you are not a mere listener caught by the well known melodies and forms. Instead, you become the one who is responsible to get the idea and if you can make it you leave the venue as someone more experienced instead of a someone entartained. I left the venue as a more qualified listener thanks to three free, creative and innovative musicians last Thursday. If you like to get such an experience catch them for their next performance.